Throughout the first half of the twentieth century, so-called “itinerant filmmakers” traveled throughout the United States, Canada, Europe, Australia and New Zealand, visiting smaller cities and making a business out of the creation of local “stars.” These “town booster” or “home talent” films featured community landmarks, businesses and, most importantly, local residents. Many of these “itinerant” films did not feature a narrative structure; rather, the camera simply panned groups of school children, business owners, and factory workers. Other itinerant films, however, either concocted some sort of limited narrative, or mimicked popular Hollywood films and genres as a method through which to focus upon the local community. The local talent films, their premieres heralded and touted in the local print press, were then exhibited along with other “short subjects” before major theatrical features. View examples of other itinerant films at the Texas Archive of the Moving Image. Watch Texas filmmaker Hugh V. Jamieson talk about his early days as an itinerant filmmaker in this interview. Download a filmography of known North American Itinerant films here. 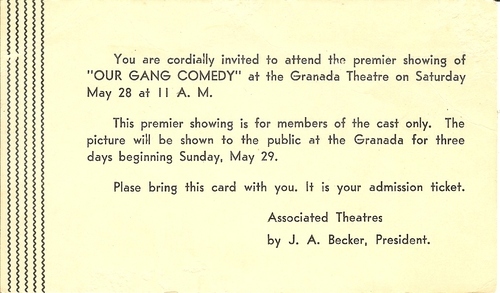 Invitation to Independence, Missouri screening, 1949.